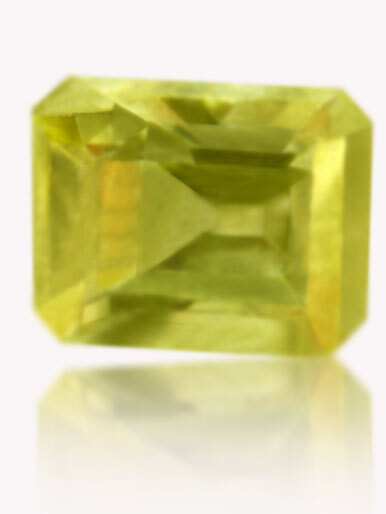 Divine Canary yellow, calibrated 5 x 4mm, crystal clarity,.71ct. This natural Burmese sapphire has clarity clean as a mountain stream, rich color and luscious luster rarely seen in a natuaral Burmese sapphire and is cut in the uncommon emerald cut making this a fine discovery! This sapphire comes with a copy of the independent lab identification / origin report. Approximate dimensions are as follows: calibrated 5mm x 4mm x 3.5mm and weight is .71ct. Yellow sapphire is said to bestow innocence, truth, good health, has traditionally been a popular choice amongst Royalty and is often used in engagement rings as an alternative to Diamonds. Is most beneficial to authors, writers, barristers, traders and businessmen.